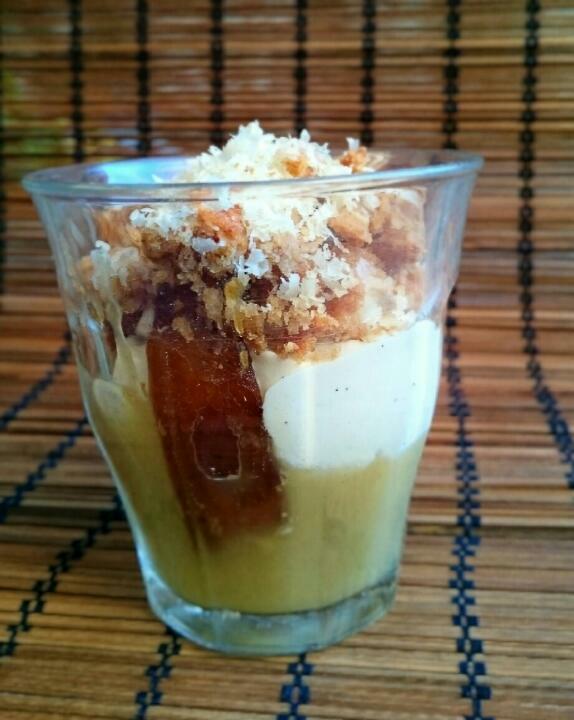 Inspiring books: Amy Chaplin, apples an dairy free vanilla cream. I devour kitchen books. I admit it. Since I was little, I was going to bed with a kitchen book by my side. I used to start with the desserts, except obviously when the book was especifically about sweets. I devoured all of them in the same way. When I started to realize that cooking was my chosen way of life, my bookshelf began to grow. At the same time that my interests were concretizing, the available space in my shelf was decreasing little by little. And in these last years, with a shift to a more healthy and nutritious concept of cooking, but always delicious, I started to get to know a world of inspiring people. I would like to start a “series” about some books that got me hooked from the very first pages , from very special and inspiring people. 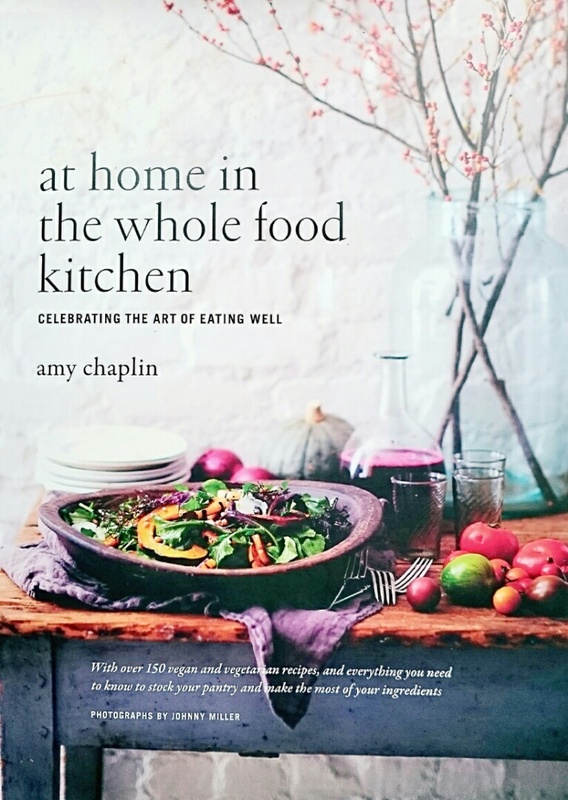 Because it has been my last adquisition, I will begin with: “At home in the whole food kitchen” by Amy Chaplin. Amy is a vegetarian chef very well-known for her work and her philosophy of real food based only on fresh produce, without artifices or unnatural ingredients, and with an important and influential awareness about sustainability. Nowadays she is working as an executive chef in a famous vegan restaurant in New York, Angelica´s Kitchen, and is also offering her services as a private chef, having famous celebrities of the cinema industry among her clients. The book is an ode to the simple,natural, fresh and delicious food. Very much in tune with what I am trying to convey through this blog. There are several chapters, not too long, and it is easy to appreciate each of them without getting confused. It also includes many photos, something that I personally appreciate it a lot. It also includes a mini chapter explaining how to make “kimchee”, or fermented cabbage (something that it is in my to do list of cooking recipes) and a mini guide in case you want to carry out a “cleansing”, but without being too extreme and using always whole foods. Obviously, I always start with the sweet part, that is to say, by the end. I can only say beautiful things about this particular chapter, I feel like making absolutely everything. It doesn´t include any vegan cream, margarines or products which seem to be healthier only because they are labeled like that, but which in reality are just processed products and nothing else. On the other hand, it includes different cereals, nuts, olive oil, coconut oil, seeds, fruits…everything that sounds good and coherent to me. My first test was this cake or “apple and almond slice”, as she calls it. We are still in the apple season and I live in the land of almonds, and so the decision was incredibly fast. At the beginning I was surprised because it was too complicated to pre-cook the base first, stir fry the apples in the pan right after and later, finish everything in the oven. 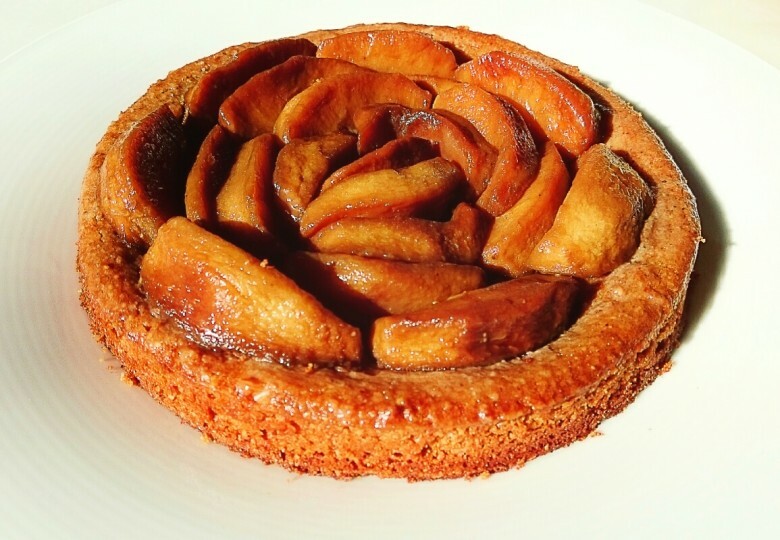 But it happened that my neurons didn´t remember that in Pancake, the bakery I had in Madrid, our apple cake was made following exactly the same method. The thing is that it is not too difficult to make if you are following all the steps one by one, and I can assure you that the result will be incredible, I could check it by myself the day I prepared it! But still in my opinion a side dish was missing, because as for me anything with apple should be always accompanied with something creamy: a vanilla ice cream, an English cream or a whipped cream. In fact, I already had a perfect recipe with cashews (the ones which give the creamy and milky texture if you don´t want to always use dairy products) and as the cake was vegan, I was able to keep the same concept. Remember that soaking the cashews is essential to get that sort of texture. In this recipe I use two cups because if I use less, my machine wouldn´t be able to work with it and as a result, I wouldn´t get the sort of texture I want. Don´t buy them roasted! This sauce is so attractive and easy to make that I would like to suggest you another preparation using a small glass, placing a little bit of apple sauce, sautéed apple and cashews cream in the bottom and over the top, some nuts, granola or a broken cookie to give a crunchy touch. My kid´s birthday is in a few days and I have decided to make it for this special day. In a few days I will also post some healthy and delicious ideas for birthday celebrations. Hope you enjoy the recipe, share it with your family and friends, with a good tea, before the winter comes to an end! 2 cups of soaked cashews for at least 4 hours . Let the cashews soak overnight. In the morning, open the vanilla pod removing the seeds and blend them along with the cashews and the rest of the ingredients until getting a creamy consistency. Let it cool. Heat the oven to 170°. 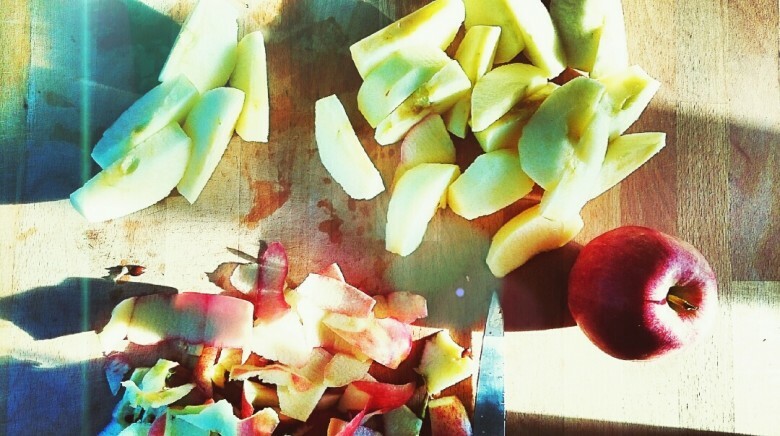 Peel and cut the apples into sections. In a big pan, stir fry them with a spoon of coconut oil for about 5 minutes at medium heat. When they start to get brown, add a spoonful of maple syrup and two spoonful of vanilla essence. Let it cook for about 6 to 8 minutes until they start to get soft. Low the heat if they are getting brown too fast. Remove from the heat and spread them in a plate or tray without letting them bunch up. In the meantime, crush the almonds and the oat flakes and mix them in a bowl along with the rye flour, the baking powder and the salt. In another bowl, mix the olive oil with the maple syrup and the remaining vanilla essence (2 tablespoons) and add everything to the mix of flours. Stir well and when it is well mixed, place it in a rectangular or round tray with parchment paper. Press slightly so that it gets evenly distributed and bake it for about 15 minutes. 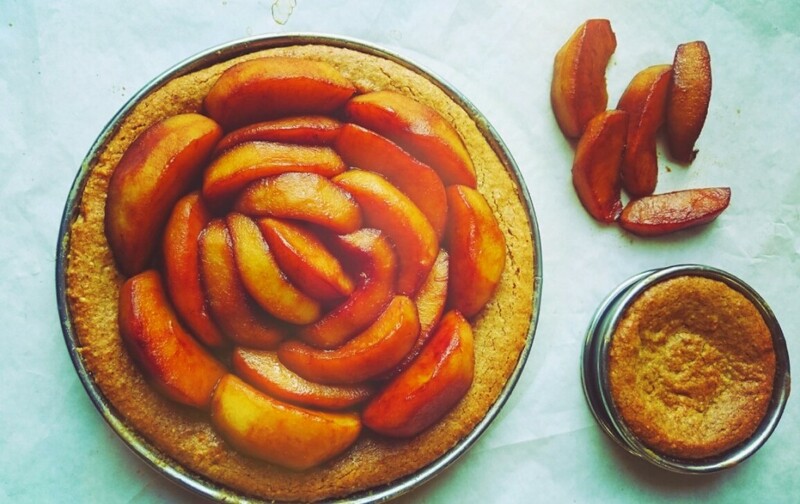 Take out from the oven and put the apples over the top pressing softly. Bake it again for about 20/25 minutes or until the edges start to get a golden color . Whenever it gets cold, you can decorate it with a bit of apricot jam which should have been previously heated. This is optional and will give it a bit of shine. 2 Responses to Inspiring books: Amy Chaplin, apples an dairy free vanilla cream. Congratulations for the recipes! Loved especially your carrot cake, which would love to try once (in a vegan version maybe).